So-called for its resemblance to a kneeling camel, this local landmark offers a panoramic view of the majestic Sonoran Desert. Camelback rises to a reasonable height of 1,200 feet above sea level and features Echo Canyon and the moderately challenging Cholla trails. The attraction’s proximity to metropolitan Phoenix makes it especially popular with hikers so go on a weekday if want to avoid the crowd. 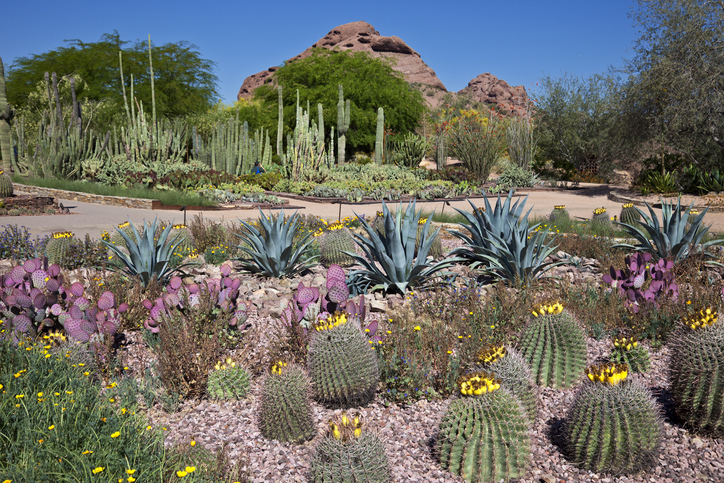 This beloved attraction proves that immense beauty can indeed grow in the desert. Spanning 50 acres, this destination treats visitors to a fantastic variety of arid plants such as flower-topped cacti and towering saguaros. The garden is also a venue for local events, including the glittering Las Noches de Las Luminarias celebration in December. The Phoenix Zoo is home to some 1,400 animals, including Sumatran tigers, Chilean flamingos, and komodo dragons, to name a few. The zoo is also a recreational hub, with a scenic desert golf course and seven acres of stocked lagoons. Become a an annual member to get great discounts and exclusive perks. The largest art museum in the Southwest houses a wide variety of permanent collections covering American, Asia, European, and Latino cultures. It also hosts many cultural activities, such as festivals, film showings, and live performances. It’s fitting that as an up-and-coming tech hub, Phoenix is home to the Arizona Science Center. Inside are hands-on exhibits that encourage visitors to explore and experiment, giving them a whole new appreciation for the wonders of science. The Center offers immersive and educational shows at its very own IMAX theater. Every first Friday of the month, downtown Phoenix is transformed into an art, culture, and food fair. Many local artists showcase their latest works, while food trucks serve dishes that give restaurants a run for their money. There’s even a complimentary trolley tour, giving you one more reason to hit the event. Saddle up and explore 50 miles of breathtaking desert terrain while on a guided horseback tour. Along the way, you’re sure to spot local fauna and flora, including desert rabbits and various cacti. The tour is open to riders of all experience levels, so go ahead and unleash your inner cowboy. Why watch sports on TV when you can catch it live? Luckily, Chase Fields is the perfect venue for all sorts of sports action. It’s also the home of Arizona’s very own Diamondbacks. The venue has a retractable roof and is fully air-conditioned, so you can watch sports matches in complete comfort. With so many attractions awaiting you, you’ll never run out of fun things to do in Phoenix. Even better, there are available real estate properties close to many of these must-see sites. Get in touch with Urban Luxe Real Estate at 480.359.6519 or info(at)urbanluxere(dotted)com today for more information.